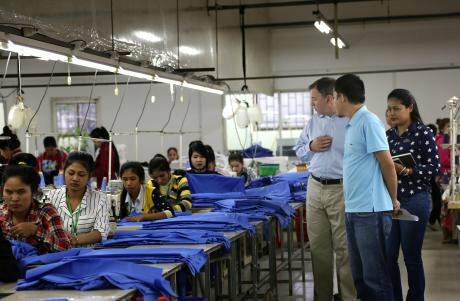 90% of workers in the Cambodian garment industry are women. USEmbassyPhnomPenh/Flickr. Some rights reserved.The case for gender equality at work is increasingly being made with economic arguments. The corporate consultancy giant McKinsey says that increasing women’s participation in the labour force could add $12 trillion to global GDP by 2025. Such claims are being used to engage the private sector and present gender equality as more than a moral concern. But pushing this 'business case' is problematic for the women’s human rights agenda. Economic arguments for gender equality effectively commodify women and their labour. They imply that women’s rights to work are only useful because there are quantifiable economic returns. This is a shift away from a human rights perspective under which rights to work are an inherent part of women’s dignity that cannot be bargained or traded away. Human rights recognises the agency and autonomy of women as humans, rather than seeing their labour as a means to an economic end. Economic arguments for gender equality effectively commodify women and their labour...The business case for gender equality ignores how the neoliberal macroeconomic system colludes with structural discrimination to disproportionately impact women, who are overrepresented at the very bottom of supply chains, in the informal economy, and in precarious jobs. The burden of unpaid care work – such as fetching water and providing food – still falls more on women’s shoulders, limiting opportunities and mobility. Until this is addressed, women’s rights to work can never fully be realised. Economic arguments also ignore prevailing gender stereotypes that result in job segregation and disparities in wages and benefits. Take the global garment industry, where 80% of workers are female amid stereotypes that women are more docile, dexterous or will make fewer demands of their employers. In Cambodia, 90% of garment workers are women, believed by the industry to be cheaper, passive and more flexible. Notably, the wage gap between men and women in Cambodia doubled from 2004-2009. ...the neoliberal system colludes with structural discrimination to disproportionately impact women. Broader dynamics are overlooked – including the unequal and often uneasy relationship between governments and corporations, with states too often looking to lure corporate investment at the cost of human rights. Governments have established export processing zones (EPZs), for example, with special incentives for corporations – and severe restrictions on workers’ rights. China, Pakistan, Kenya and Zimbabwe have changed their laws to suspend rights to unionise in these zones. Stark power disparities exist between corporations and governments, with the combined revenues of world’s top ten corporations exceeding that of 180 countries. Trade agreements often include clauses giving corporations rights to sue governments through opaque investor-state dispute settlementsIt is contradictory to appeal to this economic system, rife with structural inequalities...It is contradictory to appeal to this economic system, rife with structural inequalities, on gender equality. Instead of a neoliberal business case, women need their rights recognised as an investment in their dignity. If we want to talk about economic returns, let’s scrutinise corporate tax breaks and illicit financial flows instead. These undermine the abilities of governments to generate domestic revenues needed to pay for essential public services. If we care about gender equality, we must use the framework of human rights to engage with corporations and governments. Structural barriers and entrenched inequalities that negatively impact women in the global economy can only be addressed through a transformative framework centred on dignity, agency and autonomy. Anything less will fail women. ...the onus should be on companies to prove that they are complying with human rights responsibilities. Instead of trying to make gender equality palatable to the business world, the onus should be on companies to prove that they are complying with progressive standards and their human rights responsibilities. The UN Guiding Principles on Business and Human Rights articulates the role of both corporations and governments in protecting rights in the context of business activities. We must recognise, and work to shift, power relations between corporations, governments and women – instead of reinforcing inequalities by focusing on women as labourers with economic value. There are clear opportunities for the private sector to act on gender equality, but engagement must move beyond economic terms. We should not privatise the issue of gender equality.